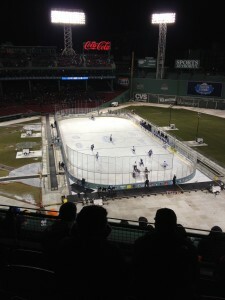 I went with Steve and his friends to a Holy Cross – Bentley hockey game that was part of the Frozen Fenway schedule. It was neat to see the hockey rink set up in the middle of the baseball diamond. 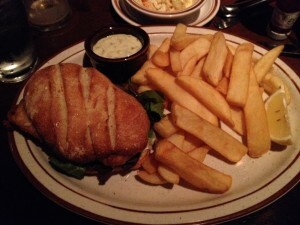 Sadly, Holy Cross lost, but even worse was the dinner we had at Lansdowne Pub, before the game. We originally planned to go to Cornwall’s (not that I know that would have been better), but they were closed for vacation. Steve made a game time decision and off to Lansdowne Pub we went (I would have opted for La Verdad, myself). The pub was packed, wall to wall. After a 30 minute wait, we were seated at a high top table that strangely situated adjacent to the bar. This meant that a wall of people was pressed up against us on all sides. Add to that the loud music, and the even louder people trying to talk over the music and you get a miserable, overwhelming and claustrophobic dining experience and I haven’t even gotten to the food yet. My fish sandwich ($11) (they did not list the actual type of fish, so I can only assume it was whiting or some of the ilk) was mediocre at best. The bun was a hard, oversized roll that caused the soft fish (read: not crispy) to squish out the sides. The coleslaw was too sweet and the tartar sauce tasteless. My steak fries were okay, but were lukewarm when they arrived. Steve shrugged and said his burger ($11) was “okay” and half of Erin’s three sliders ($11) were left uneaten. I told Steve it was the worst dining decision he has made all year – this was on December 28th, 2013.